No doubt about it! Brazil is wild! The Amazon was my “wild” destination; but, catching the enthusiasm of the small International Expedition group, and to experience more of Brazil’s wildness, I joined their three-day add-on trip in search of the golden lion tamarin, one of the world's most endangered species. Spectacular two-hour drive took us to Poco das Antas Biological Reserve, one of the few places to see tamarins in the wild. Our guide led us on a short walk to a line of trees where we stood quietly listening for the telltale rustling in the trees, then a someone whispered, “There they are!” Sure enough the tamarins had arrived, their long glowing golden fur glistening with droplets of rain. For over an hour I watched them eat, groom each other, and leap from tree to tree. 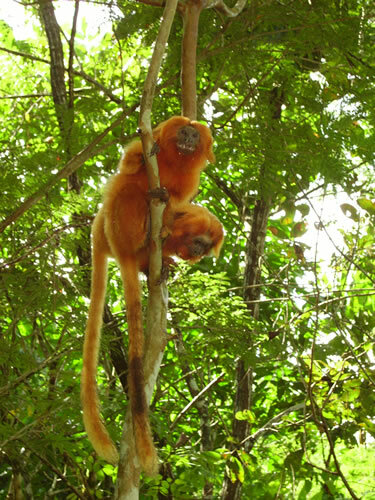 National Zoo Scientists and collaborators in Brazil introduced zoo-born golden lion tamarins into the forests, primarily onto private lands where the owners have kept the forest intact providing the necessary habitat for sustainability. During the 35-year project, the tamarin population in Brazil’s Atlantic Coastal Forest rose from 200 to 1,500. The program has been “wildly” successful. Before returning to Rio, we went on a bird-watching hike in Serra dos Orgaos Park and got lucky. 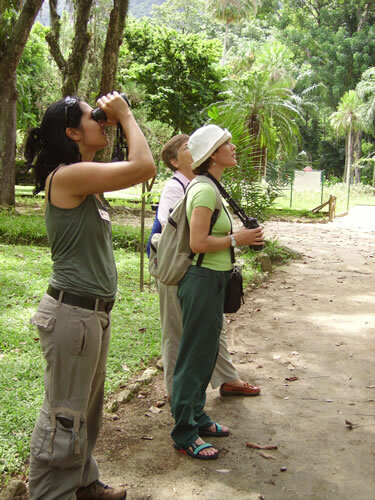 We spotted a Black and Gold Cotinga, a rare bird endemic to the Atlantic rainforest park. Another wild experience! From Rio I caught my pre-scheduled flight to Manaus, a city of two million people in the middle of the Amazon. Shortly after I arrived at the Tropical Hotel on the edge of the city, Gustave J., the manager said, “Today is a big day for us. 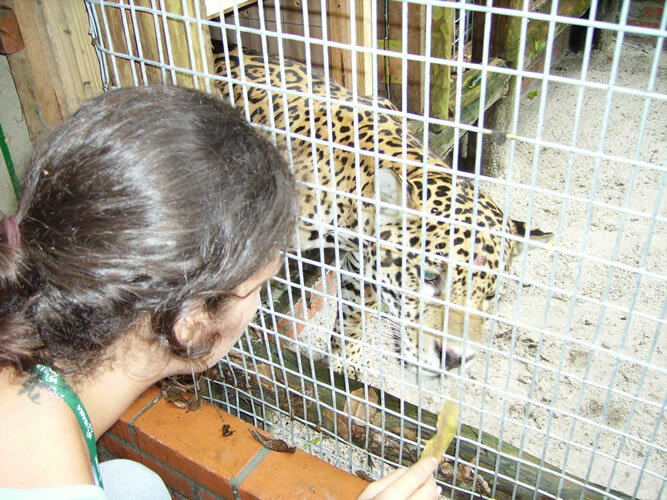 Any minute now a rescued jaguar will arrive to join our hotel’s zoo. Want to watch?” Of course! 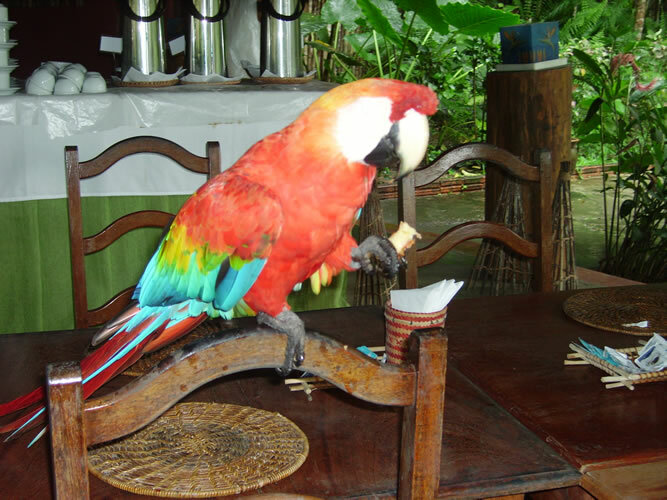 The Tropical Hotel is approved by the Brazilian environmental agency, IBAMA, to accept rescued animals. I arrived at the zoo nestled under the trees behind the hotel just as the truck bearing the jaguar arrived. The crate was propped up at the opening of the newly built jaguar home. With the hotel veterinarian in charge, we waited in heightened anticipation for the jaguar to awaken from his induced sleep. Finally a spotted head appeared. What a magnificent creature! Slowly and groggily the jaguar crawled out of the crate into his new home, staggered over to a corner, and went back to sleep. When I checked an hour later he was on the prowl inspecting his new home. “From my father, who learned from his father, and now I am teaching my son,” he explained. 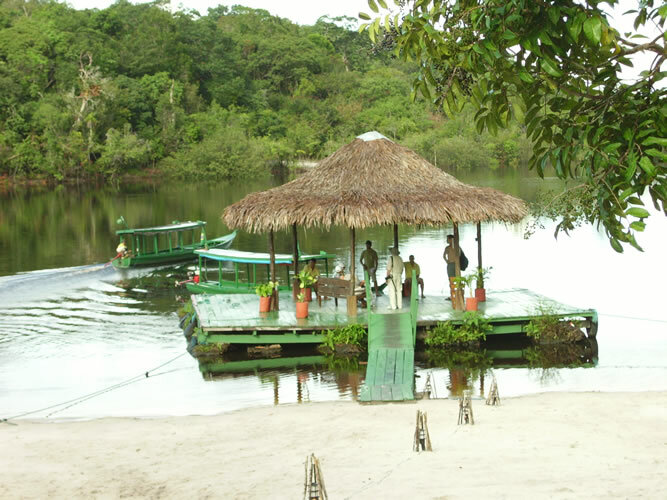 That evening Iury took me on a caiman-spotting adventure. In a small wooden boat we poled through the mangrove and saw only a few caiman. Gliding under the trees, with the moonlight dappling the black water, the constant cric-cric of the frogs, and an occasional buzz of an insect was a surreal experience. 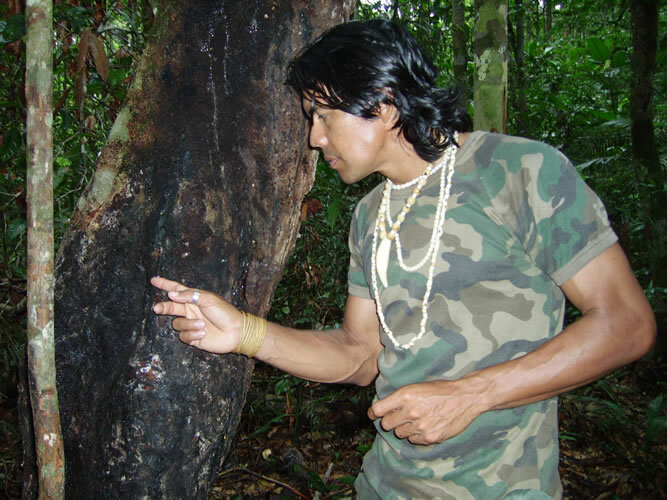 Each day was an adventure in the wilds of the Amazon. Leaving my air-conditioned cabin in the morning I paused to watch the monkeys capering in the trees, slowed down to let a lizard cross my path, watched flittering butterflies, and listened to chirping birds. One morning I tried my luck piranha fishing, even though I only caught one, I did see a rare passion flower in bloom, and more birds and butterflies than I could count. On the way back to the Lodge, I visited the Primate Rehabilitation Center, an IBAMA approved center for primates confiscated from illegal sales and reintroduced to the rain forest. 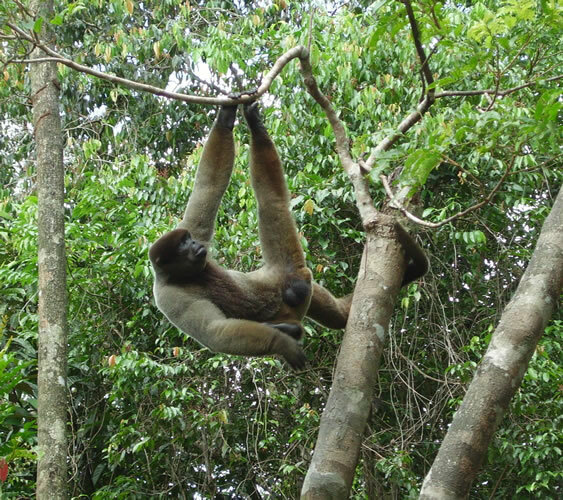 It was a thrill to see a red-faced uakari with its human-like face and observe the wooly monkeys swinging from tree to tree. From Manaus I flew to Salvador Bahia on the Atlantic Coast where I learned about a “wild” volunteer project. 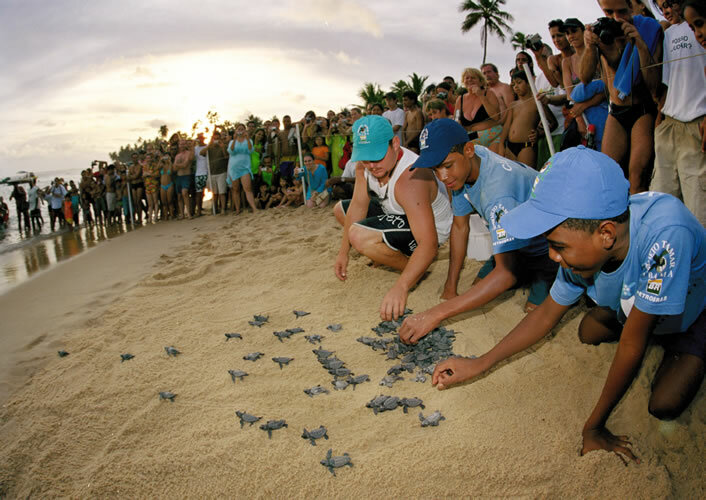 Tania G., the manager at the Holiday Inn, told us, “I lived in Praia do Forte where the TAMAR Project conducts research and protects the endangered sea turtles. It is just a few miles from Salvador. In fact I adopted a baby turtle and released it into the ocean.” The release project came about because the turtle population was rapidly declining due to the selective killing of the females as they came ashore to lay their eggs. The project has successfully increased the turtle population. I was sorry I missed the prime release time, which is January and February. It will give me another excuse to visit wild Brazil. 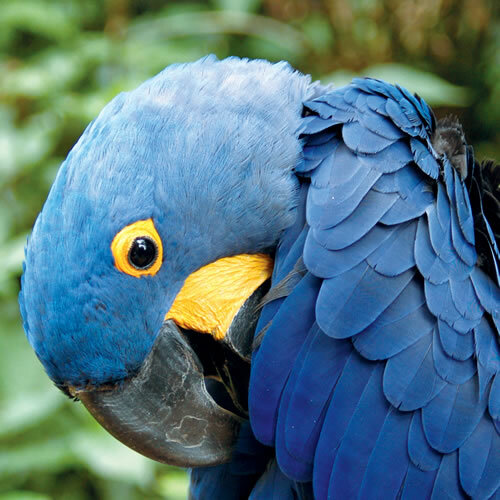 It is easy to be wild about Brazil. The wildlife can be found everywhere – on the savanna, along the coast, in the rainforest, and even in the cities. To be able to see so many animals and birds in one country, especially those on the endangered list, is an amazing and “wild” experience.